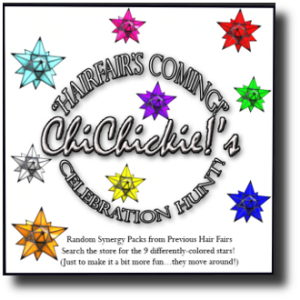 You don't get hunts that are for hair often and here is another one here. And there are lots of hair, 9 of them in fact, including a fat pack. However, the trick is this, this hunt is not like other hunts. You will need to find these 9 colored stars in the shop which appears randomly. At first, you may find lots of repeating ones, but eventually you will get all 9 of them. Let Kitty show you what the hair looks like, even though she do not like to mess around with her hair in general.